Power either some or all of the rollers to propel the load down the line. Roller conveyors shine where the load is solid and stable, but can be adapted to many load types and situations to improve throughput, reduce costs, and increase ergonomics. With hundreds of successful power systems implemented, we can help you create a productive solution. Model 190-NSP is a medium-duty live roller conveyor using 1.9" rollers that allow for up to 15 pounds of capacity per roller. Straight and curve sections are available in overall widths of 18", 24", and 30". The Model 199-CRR is a medium duty chain driven roller conveyor used for conveying in a variety of industries. It produces a positive drive that aids in many manufacturing processes. Suitable for pallet, drum, and heavy component handling in distribution, manufacturing, and other heavy conveying applications. Each roller is driven by individual chains, one extending to the previous roller, and another extending to the next in line. Use this calculator to determine how wide your curves should be so packages don't jam against guardrails, or overhang the curve and contact nearby obstructions, causing a jam or damage. 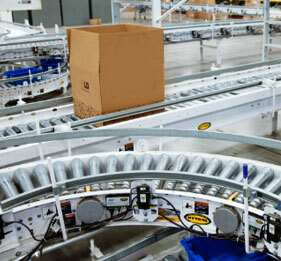 Live roller spur conveyors are used in diverging or converging applications. They may be self-powered or can be slave driven from ACC or LRC conveyors. Sometimes moving a package to the right or left side of a conveyor to properly line up or track properly through the next conveyor requires skewing the rollers in the conveyor frame. Use this calculator to determine how far a package has to travel across skewed rollers to move it closer to the side in the required distance.